Not to be confused with "warm smell of colitis". I always thought that song had to do with the decadence and crazy but fun insanity in LA.This is really a party town and it's so easy to get caught up in it here. And once you are here, it's almost impossible to leave and it's kind of Never Never Land because no one grows up, you will see people in their 20s and 60s at the same parties and it's like there's no difference. In addition to ethnic diversity, we have age diversity and it's really one crazy never ending party. And so full of extremely creative talented people, almost everyone I meet is in a creative field, from filmmaking, writers, acting, directing, photography, music, art, VR, animation, cinematography, app making, or those in holistic fields like yoga, metaphysics, meditation, green clean energy, recycling, organic food, We are a cliche, but I love it. I can travel out of LA for a while, but I'm always so relieved to come back. Especially now with the current political transition.. We really live in a LA LA Land bubble here. In high school, after visiting LA from NYC, I wrote my own lyrics: "Living in a city of fantasies, palm trees, a warm breeze, living an illusion, searching for amusement, pretty people, people, smile. Funny, but I'll be one of those people in a while... ( I was planning to go to UCLA and did.) After recent developments I was considering moving to Canada, but I really love it here too much... I think all creative people should move here.i don't think I'd fit in anywhere else. I like our little bubble LOL. ROFLMAO!!! Yes, please let's not confuse those...one little vowel changes everything! @Wonderland My son recently moved to San Francisco from here in the Midwest. He's loving the food, art, architecture and the people. He's a techy but also highly creative, and loves being in the middle of Silicon Valley. I think he's found his tribe and will probably stay there forever. I miss him, but am glad he's happy. Hoping to visit him at some point and enjoy it with him. Is there any particular reason the RDNA stuff does not stack like the daz in the stacking sale? I noticed some weirdness yesterday. Do you have a new item in your cart that isn't a freebie? RDNA things are stacking in my cart. 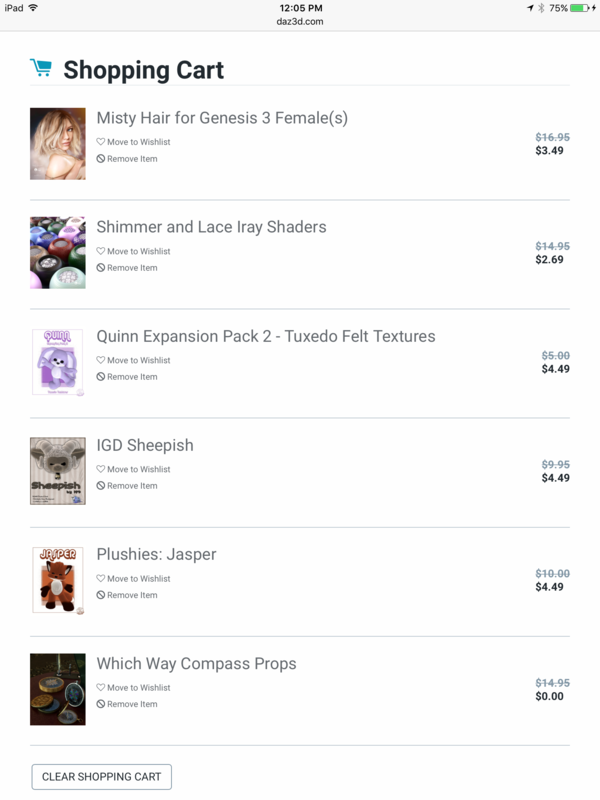 I even took out everything in the cart and just added the RDNA stuff. The same thing $4.99 with 3 of them in it. Oh, well really not worth the bother to bug CS about it, just won't buy is all. I think I found the problem. RDNA items are stacking BUT RDNA items that are also PC+ items are NOT stacking. They are some very interesting stacking deals today. That's all I'll say...They probably won't last long. Here's a cute bundle that's in the 80% off RDNA Top Sellers if you buy a new Southern Charm item (that sale is probably going away soon.) It comes with a lot of stuff in it and since it's by Evil Innocence, who does Crossdresser, it includes two Crossdresser licenses for these figures so you can convert clothes from 130 figures to these adorable Ninja Sprites. Think they'd look good in the Elvis suit? The Lady Littlefox original figures for Star, Cookie, Chip, Little Bit, Unicorn and a bunch of others are in that sale too. The add-ons for them are in the RDNA Stackup Sale. Good deals to be had, with and without glitches. And if you ever wanted to create fantasy creatures on a budget, hard to be 92% off a nearly $300 bundle! RDNA products don't seem to be stacking at all..
Those are the ones I noticed yesterday. Sorry to see they're still doing that. I want my plushies too! And it still adds "Save" to my posts. Weird. It seems to be working at least the prices have changed :) Thanks! Hmm, doesn't seem to be showing Balneae for $2.69. Kinda strange. Though it's still a decent price. I nearly went for that, but 1% should make it 5 cents off, not one cent. Sorry DAZ, not playing that game (etc). There currently are a lot of those 'deals' Any of the RDNA items that cost $5 and are in the RDNA stackup sale are discounted to $4.99. I'm getting wrong pricing for Balneae from the current stack-up sale. Am I doing something wrong? You're not doing anything wrong. There was a problem with some products not discounting properly and I guess it didn't get fully fixed. I bought it anyway. It's not so expensive.